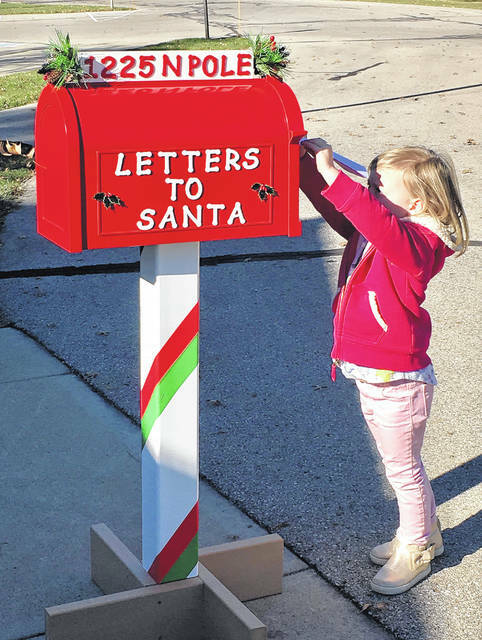 Santa Claus has placed one of his special mailboxes in front of Orange Township Hall for children to mail letters to him. Santa said he would respond to all letters received by Dec. 17 that have both the child’s name and address on the envelope. Taking advantage of the mailbox by getting her letter in early is Hattie Alt. Orange Township officials are expecting a very special visit from Old Saint Nick for the township’s first-ever holiday celebration. The event is scheduled from 4 to 6 p.m. on Sunday, Dec. 3 at the Orange Township Hall, 1680 E. Orange Road, Lewis Center. Sheterom said raffle tickets will be given to the children for a chance to turn on the lights on the tree. She said Santa and Mrs. Claus will pick the winning ticket, then at that point, the child will come forward to pull the lever. Sheterom said as long as the letters have the child’s mailing name and mailing address on the envelope, they will get a response from Santa. She said the letters have to be received no later than Dec. 17 to get a response from Santa. Sheterom said the children will have a chance to visit with Santa and Mrs. Claus and have their picture taken with them. She said Santa would be forgoing his sleigh and arriving in an Orange Township parks vehicle. For information, go to orangetwp.org.